Excluding animal products from your diet as a vegetarian or vegan is a choice some people have the luxury to make, and if they know what they’re doing, and take care, they can be perfectly healthy. But there are probably far more people who have no choice in the matter. They would eat meat if they could, but they simply can’t afford it. For those people, a little bit of animal source food – milk, meat, eggs – can make a great difference to their health and wellbeing. It can be easy to forget that, in the clamour for meatless Mondays and other efforts to respond to climate change. There’s also the fact that in many parts of the world, animals play a very useful role in transforming things people can’t or won’t eat, like grass, into good food. 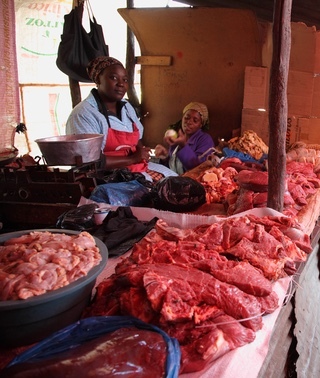 One of the organisations promoting greater access to animal source foods is ILRI, the International Livestock Research Institute. They’re faced with some formidable challenges. One is to ensure that more animal foods doesn’t mean greater emissions of greenhouse gases. The other is to manage food safety as the demand for animal source foods grow. To find out more I talked to two people at ILRI: Shirley Tarawali, Assistant Director General, and Delia Grace, a veterinarian and epidemiologist. Giving up on animals as a source of food is a luxury that many people cannot afford. For poor people in developing countries, a bit of animal source food can greatly improve their health and wellbeing.